There are numerous legends in the world of music, and those who have been successful have all been given a nickname to match their status. Elvis Presley became the King of Rock and Roll, Madonna became the Queen of Pop, Aretha Franklin became the Queen of Soul, Michael Jackson became the King of Pop, and Mary J. Blige became the Queen of R&B. Yet, there are very few people who have surpassed this first stage and entered into the realm of gods and goddesses. One of the most famous women to have a place in this epic circle of musicians is Cher, who is now known as the Goddess of Pop! After facing poverty and neglect when she was a child, Cher made it her mission to make it big in the world of music. Although she is known for her sleek and long locks, it’s fair to say that Cher has experimented with some wacky hairstyles over the years. During this public outing, she opted for a spikey mullet that only she could pull off. As if the look wasn’t daring enough, Cher decided to tidy the whole thing up with loose harem pants that showed off her tiny waist, as well as an old-school shirt that she tied in the middle. It’s both feminine and masculine, weird and wonderful, cool and uncool, and the epitome of Cher’s style. How the heck does she pull this stuff off? Throughout her career, Cher has made it known that she loves the color black. Thanks to her dark hair color and her fair skin tone, wearing black makes her look even more gothic and fabulous. Yet, she decided to have a little change around during the premiere for her movie musical, Burlesque. For this red carpet event, Cher decided to don a red wig that would make her stand out from the crowd. In fact, we don’t know whether her hair or her outfit is more impressive! It’s always been Cher’s intention to stand out from the crowd. Not only does she make music unlike anyone else in the business, but she also ensures that her friends, family, and fans will be able to spot her amongst the other famous people in her life. She made sure this was the case during one Oscars ceremony. Instead of wearing a elegant ball gown that covered her frame, Cher showed off her stunning figure and wore a weird and wonderful mix of sparkles and feathers. Although Cher likes to shock and startle all of her fans and followers with her eclectic style, sometimes she does dial it down with a more classy look for the red carpet. On this occasion, Cher looked fabulous when she wore a black mini dress. While this would have looked ordinary on another celeb, Cher made sure that she put her own personality into the outfit with fishnet tights, diamonds, lace, and a whole heap of eye makeup. After all, she wouldn’t be Cher without the eye makeup! 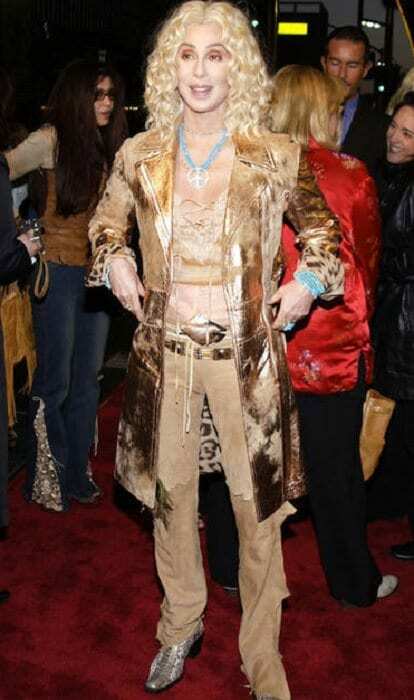 On another occasion, Cher teamed up with actor Val Kilmer to rock the runway. He looked dashing in his shiny suit and bow-tie, and Cher looked just as dazzling in diamonds when she wore this beautiful sheer-and-sequin number. With diamonds and embellishments everywhere, the people around her probably needed sunglasses to look at her properly – but it was well worth it. The slit goes down to her belly button, the jewels show off her incredible figure, and the makeup shows off those impressive cheekbones that we’re sure could cut glass. Since gracing the music world with her presence, Cher has taken part in so many photo shoots she has probably lost count of how many she’s posed for. However, this still remains one of her most famous shoots to date, owing to the fact that she looks absolutely extraordinary. Although we could never pull of a side ponytail or a dress that barely covers her nether region, Cher seems to be rocking the entire outfit. To top it all off, she’s enacted the perfect pose for a daring look that has since won over the world. Cher is incredibly proud of her body, and we definitely don’t blame her for showing it off. During the early stages of her career, Cher would do anything to show off her washboard stomach and her thin physique. Yet, she wasn’t content with just having her stomach out and leaving it at that. She wanted to make a statement! She certainly did that when she turned up to a performance with sparkling white pants and a feathered headdress. That’s one daring look to remember. When it comes to fashion, there are certain rules that we like to keep. Everything needs to match, and our colors need to work together… but Cher has never been about that life. Instead of perfecting all of her outfits, Cher puts together a mishmash and leaves it at that. For this American Music Awards event, Cher decided to pair tie-dye pants with a lace corset, topped off with a feathery jacket. Of course, she didn’t want to just leave it there. Cher then finished the outfit with some form of plastic piping headdress. I mean, do we need to say anything more? Cher transformed into an ethereal goddess when she donned this impressive outfit for an awards ceremony. With jeweled hair pieces on her head, giant earrings, and that extraordinary makeup, Cher would have turned heads if she was covered up in a potato sack. 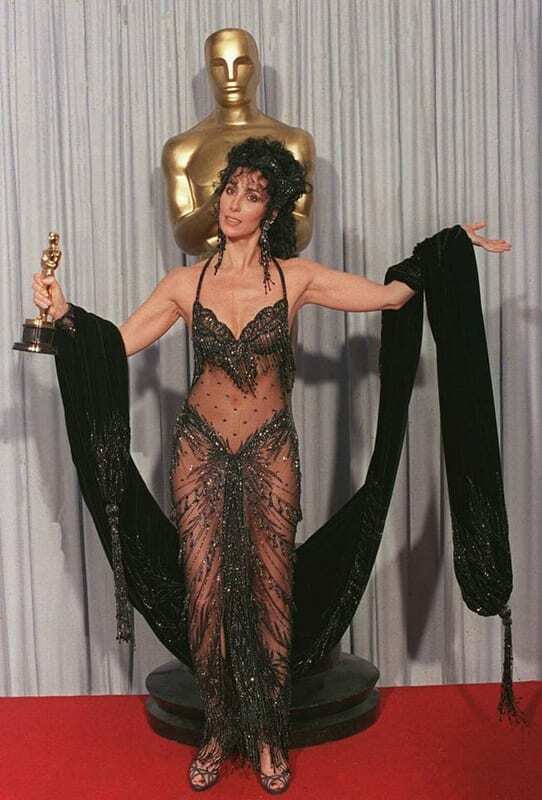 It just so happened that Cher wasn’t covered in a potato sack, and was instead wearing an incredible figure-hugging embellished dress complete with sheer fabric and little peeps of skin. This is definitely one of her most daring designs. As you can probably tell, Cher just loves to cover her body with sheer fabric – so it’s almost like she isn’t wearing anything at all! This thin fabric is perfectly draped over her assets to cover her modesty but gives just enough away to make it both daring and risque. Designed in her favorite color, this black bedazzled dress is the perfect look for an Oscars ceremony, as her golden statue complements her dark frame. Pair this up with a huge shawl, and you’re onto a winner. Considering she spent most of her early career wearing black outfits and looking like Morticia Addams, fans around the world were utterly bowled over whenever Cher incorporated color into her wardrobe. Normally this was in little snippets with accessories, so the world went wild when Cher stepped out in this incredible red ensemble. This racy off the shoulder pantsuit exposes all of the right areas of Cher’s amazing physique and gives us the pop of color we’ve always wanted from the singing sensation. The Billboard Music Awards are a huge deal if you’re in the music industry, and Cher knew that she had to impress when she attended the ceremony in 2002. However, she didn’t want to lose any of her eclectic personality. Rather than sporting a boring old gown, Cher decided to take on burgundy for the Billboards and wear a co-ord set that both covered her up and showed off some skin. With tassels and jewels galore, this one was bound to leave a lasting impression on the hosts and the other guests. In the past, Cher has often been likened to Cleopatra. With her dark features, her thin physique and her striking eyes, she has always been a dead ringer for the Egyptian ruler. For one public appearance, Cher decided to put the public out of their misery and unleash her inner Egyptian. With this violently sheer skirt and shirt combo, this outfit definitely didn’t leave much to the imagination. Cher also coupled this up with a brand new hairdo and a wacky headdress and proved that she really could walk like an Egyptian. Over the years, Cher has loved to adorn her perfectly formed head with weird and wonderful headdresses, and this event was no different. This spiky accessory looked incredible on top of her eye-popping ball gown. While you can see that she has worn a slip underneath the jewels, this dress has also shown just the right amount of skin – from her assets to her shoulders, and even to her legs. In fact, this spider-like outfit has got us all in a spin and is perhaps one of her best yet. During her career, Cher has made it known to the world that she is not your typical girly-girl. Although she loves clothes and makeup, she does that in the name of creativity – rather than vanity. Nevertheless, Cher looked lovely in lace when she turned up on stage wearing this ensemble a few decades ago. This see-through fabric once again leaves little to the imagination but shows off her perfectly toned physique like nothing else we have ever seen. I mean, is there anything this woman can’t wear? We think not. Working Through College: Does It Pay Off?